Without Rhyan Grant on the right, Sydney are shorn of a key attacking element. Luke Wilkshire, dependable and defensively stolid, is nowhere near as skilled or willing an attacker. Having not scored a league goal for nearly a decade, Wilkshire missed two opportunities to end that drought against Perth, chances that Grant might well have converted. These misses were nestled neatly in between a number of under-hit or misdirected crosses; Wilkshire’s value somewhat tapers off the further up the pitch he goes. As the fullbacks – sliding forward when Sydney are in possession, with the space behind them covered by the holding midfielders – are such a significant part of Sydney’s attacking system, Wilkshire’s limitations often cause Sydney’s attacking play to lean lopsidedly to the left, with Michael Zullo a much more potent option. This is a slightly limping version of the champions, and for opposing teams it should make the defensive game-planning significantly easier; a reduced threat on the right should allow for an increased defensive effort on the left. 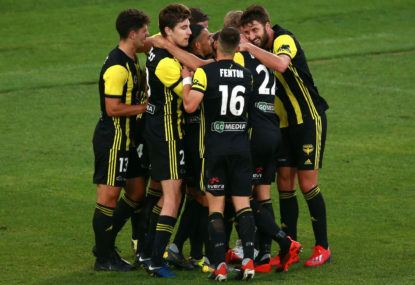 In Friday’s match, Perth appeared to take advantage of this, in a way; Diego Castro, a sumptuous attacker, but one of the league’s least engaged defensive forwards, was stationed initially out on Wilkshire’s flank, and his reluctance to track back was less damaging than it would have been had Grant been playing. 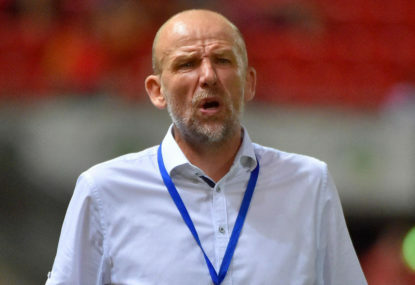 But it didn’t take long to see how Kenny Lowe’s placing of Castro on the left was probably not a tactical decision, made with Wilkshire’s reduced threat in mind, not least because Castro appears to have free license to roam across the full width of the pitch. Furthermore, there was no extra effort made by Perth to suppress the more potent fullback on the other side, in fact Chris Harold, the winger matched up with Zullo, was heinously guilty of defensive negligence throughout. In the opening 15 minutes, Harold was seen at least three times drifting infield, fully aware that Zullo was sliding forward on the wing, ready to receive a long ball over the top. 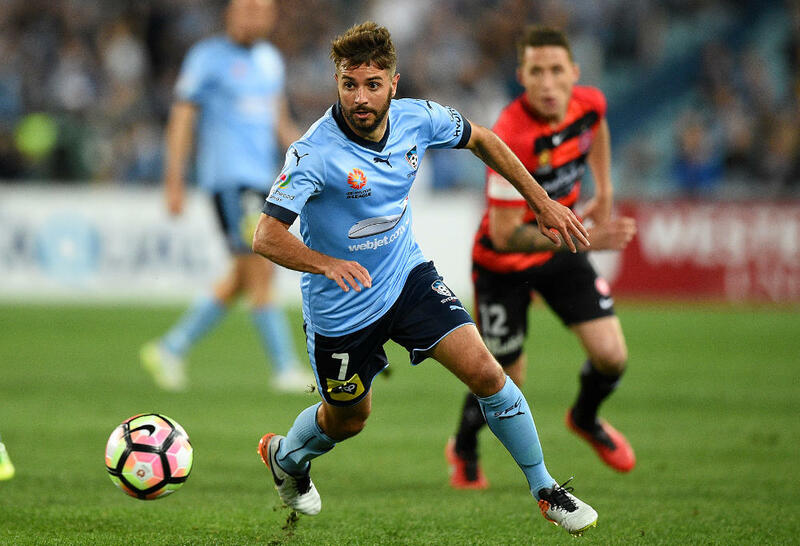 Lowe and Harold knew that Zullo was the more dangerous of the two fullbacks, could see that Sydney’s centre-backs – Jordy Buijs in particular – were looking to spear diagonal balls to him, and yet did almost nothing to thwart it. Here, Buijs plays the first threatening diagonal ball to Zullo, a wonderful, laser-guided pass. You can see Harold glance over his shoulder at Zullo in space, aware of his presence, and yet unwilling to mark him. He barely contests Zullo’s cross, which fortunately for Perth was scuffed into the first defender. A warning shot. Then, literally 30 seconds later, Zullo is found again by Buijs, with Harold wandering around the middle of the pitch. Zullo plays in Milos Ninkovic, and Harold ends up clearing the danger, positioned well to clear through blind luck; he’s not even really aware of Zullo darting in behind him to collect Ninkovic’s backheel. So, having twice allowed Sydney’s overlapping fullback to make or initiate dangerous inroads into the final third, there appears to be no change in Harold’s off-the-ball marking; here, after Sydney regather possession from Harold, and start patiently working the ball across the park, just watch how Harold again drifts infield, leaving Zullo completely unmarked on the weak-side, in acres of space. 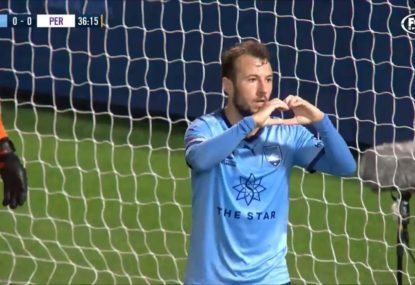 Another Buijs diagonal could have been hit – Buijs shapes to try a third at one point in the sequence, with Harold wandering basically inside the centre circle, but decides against it – and Zullo would have been played in again. 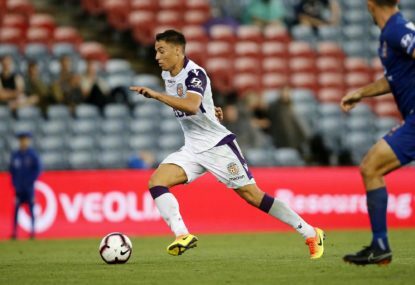 Scott Neville, the Perth right-back, is sliding inward to double up on Ninkovic, and the centre-backs are occupied with Bobo; Zullo – again, Sydney’s and the one of the league’s most talented attacking fullbacks – is Harold’s man specifically, and three times in the space of three minutes he’s seen egregiously shirking this responsibility. This all came during a period of heavy Sydney dominance, where they enjoyed more than 70 per cent of the possession. 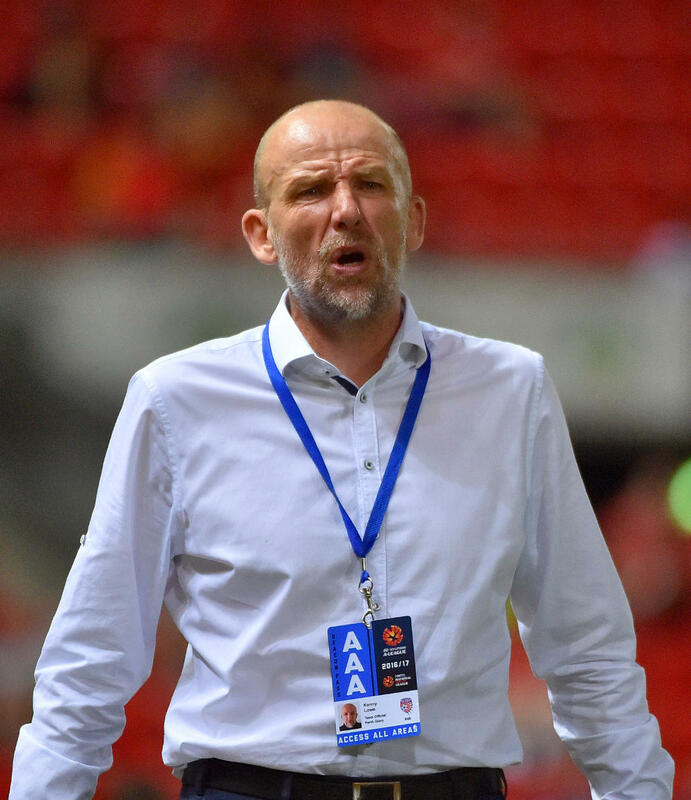 It happened again a littler later, with Zullo clear and free on the counter for Sydney, and Harold somewhere behind the play, having just been lingering alongside Adam Taggart in a striker’s position. Then it happened again on the other flank, a sequence that ended in the first of Wilkshire’s two golden chances. Here, it’s Castro who’s seen just dawdling, marking no one, in the middle of the pitch as Wilkshire streaks forward on the weak-side, and is found by Ninkovic. Wilkshire, hesitant and skittish, should have shot first-time, and he should have scored. These last few moments occurred after Sydney had missed a penalty. Is this Harold and Castro simply neglecting their duties, going rogue and chasing attacking glory, leaving gaping holes in their team-defence as a result? Or is this what happens when a team is sent out with no coherent, considered defensive game-plan, tailored to the opponent, who, by the way, are still the best team in the league? I suspect it’s the latter; take a look at this sequence, again from the first half. Harold drifts infield once again, but notices Zullo in time to come across and marshal him once the long diagonal ball is played. Brandon O’Neill takes up possession, and is given the freedom to progress up the pitch completely unmolested. You can see Xavi Torres get caught in two minds; should he stick with Ninkovic, who’s lingering on his shoulder, or go and close down O’Neill, who’s scampering into the final third? In the end he does neither, with Neville unwisely retreating and Harold marking Zullo out wide. Ninkovic gathers the ball and shoots. This is what it looks like when a team is defensively unprepared, when the structure is flimsy, marking assignments are barely observed and positioning is lax. Did Lowe address this at half time? Well, 90 seconds into the second half, the exact same lapse occurred again, with Harold again at fault and Zullo and Sydney again profiting as a result. You can see, as Sydney take their throw in on the right flank, that the Perth centre back on the far side is motioning toward Zullo, urging Harold to keep track of him. His teammate’s advice flatly ignored, Harold instead charges towards the ball, ending up on the opposite side of the pitch. The ball is worked around Harold and out to Zullo, who has space and time to set up a simple one-two with Ninkovic. Harold, now charging wildly back to defend his flank, fails to cover Zullo, who collects Ninkovic’s return pass and spears in a dangerous cross. Goodness me, how many times must a team be punctured, in exactly the same way in exactly the same area, before a self-preserving adjustment is made? This game was marred by a sluggish VAR intervention, and the second half withered away into a snore-inducing grind. 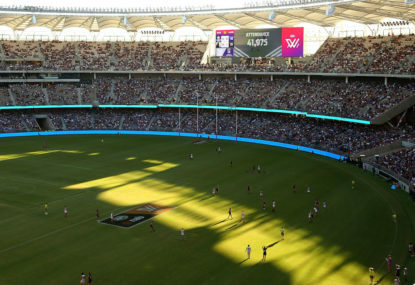 Perth might even have finished the game under the illusion they were unlucky to lose by more than a goal. In reality, they defended generously enough to have shipped three or four goals in the first half alone. What is Lowe doing sending out his team like this, with players seemingly held totally unaccountable for absent off-the-ball defending and impetuous roaming from position? 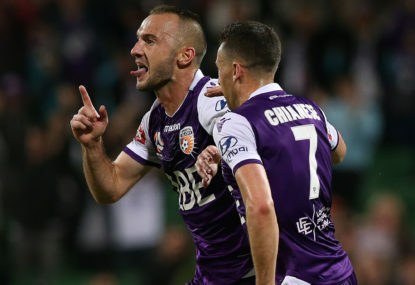 It isn’t a secret that Sydney’s fullbacks – even a second-choice pairing – form a crucial part of their attacking system, and yet Perth played in a manner implying they either had no idea this was the case, or that their manager simply didn’t care to address it. Perhaps Castro, former Johnny Warren medallist, offers enough – although not really in this match – to forgive his defensive negligence, but his laziness in this regard was made all the more galling when the current Johnny Warren medallist, Ninkovic, was so active and industrious by contrast. Liam Reddy made seven saves, and Perth were forced to make 47 clearances in this game. They have now conceded seven goals over their first four matches, the same total through four matches as they did last season. Their defensive approach has not improved over the off-season, it may even have worsened. They will have little success this term if Lowe continues to allow his team to defend so recklessly.